When my friend Bkwyrm approached me to ask about doing a logo for her new forum for parents with an occult bent, Parentes Nefarii, we tossed back and forth a couple of ideas. In the end, we decided that her budget and needs were best suited to a cartoon — but not of her. This weeble cultist (yep, Weeble Wednesday is back!) 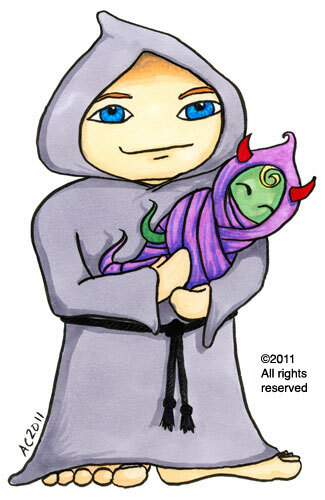 is carrying a rather dubious-looking baby, from tentacles to horns. The innocent baby-blonde curl of hair really makes it for me, especially contrasted with the bald cultist and his bluer-than-blue eyes. Nefarious Parent, 7″x5″ pen and ink and Copic Marker on watercolor paper, not for sale (commission). This, and all my other commissions, aren’t for free use per the Creative Commons license below — all rights are reserved for the commissioner*. *And the Commissioner always has Batman on his/her side.